America’s first national park, Yellowstone, is in our backyard. We’ve been exploring the park ourselves and sharing our local knowledge of this great American treasure with travelers for three decades now. Our partnership with National Parks Conservation Association adds that much more depth and accessibility to our small group and custom trips. When you really want to see and explore Yellowstone—and understand this complex and significant landscape—come with us, Off the Beaten Path. 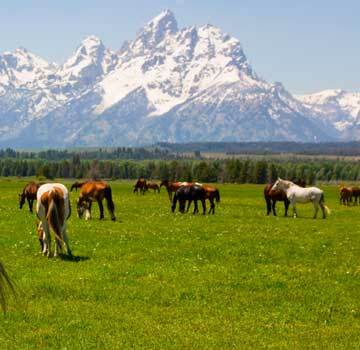 Whether you're looking for a guided group tour in Yellowstone or would prefer a private custom trip, Off the Beaten Path knows how to help you find adventure and connect with the authentic heart of this iconic national park. A Yellowstone trip is tradition for many families, and it's a great destination for couples and friends traveling together. In our experience, two main draws inspire people to vacation in Yellowstone National Park: wildlife watching and exploring the park’s geysers (most famously Old Faithful! ), hot springs, and other thermal features. Yellowstone might have the most unique mix of natural wonders of any national park in the country, definitely earning its designation as a World Heritage Site and Biosphere Reserve Site. Encompassing 2.2 million acres (mostly in Wyoming and some in Montana), the park holds a huge variety of geothermal features—fumaroles, geysers, mud pots, and thermal pools—wondrous wildlife, a sweeping landscape, pristine rivers, and many lakes, including Yellowstone Lake, North America’s largest high-elevation lake. The 18-million acre “Greater Yellowstone Ecosystem” surrounding the park is still predominantly wild too, with abundant wildlife, fish-laden rivers, and public lands for hiking. The best way to see wildlife in Yellowstone National Park is to tour the park with an Off the Beaten Path guide! That holds true whether you are on one of our small group trips or are traveling on a private trip we design just for you. The best time to see wildlife in the summer months is early morning or twilight when the weather is cool and animals are out browsing for food. Animals are often bedded down in the heat of the day. When looking for wildlife, keep habitat in mind. Look in and around rivers for bald eagles, trumpeter swans, Canada geese, herons, ducks, moose, and beaver. When you’re crossing the park’s wide open meadows, look for coyotes, elk, pronghorn, bear, wolves, deer, and bison. Bighorn sheep may be found in cliff and rocky areas. Most importantly be patient, be quiet, and when you do see something, be respectful. Experience has taught us that just watching the often fleeting appearance of a wolf or a bear will be a far more rewarding and memorable experience than a frantic grab for the camera while that magical moment evaporates with the creature into the trees. Winter is also a superb and very special time to see wildlife in Yellowstone. You won’t see bears because they’re hibernating. But wolves, bison, elk, foxes, coyotes, and many other creatures remain active and have come down from the high country to gather in snowy valleys and warm thermal basins. Most park roads are closed but you can catch a snow coach or special park vehicle into the Old Faithful Snow Lodge, which remains open for the winter. An estimated 30 to 60 million bison roamed North America in the 1700s. Lewis and Clark described the herds as a “moving multitude that darkened the whole plain.” Falling to the pressure of Western settlement, only about 200 bison remained in the wild by 1889, and in 1902, there were only 44 animals. Fearing extinction, the park imported 22 bison from privately owned, semi-domestic stock herds as a foundation for a bison ranching project in Yellowstone’s Lamar Valley that spanned 50 years. Some intermingling of the introduced and wild bison had begun in the 1920s, and in 1967, all ranching and herd reduction activities were phased out. By 1978, the herd reached 1,626 animals. Currently, there are around 5,500 bison in the park, the largest population on public lands in the country. Bison mate in July and August and give birth in late April and May. You might see them rolling in the dirt, or “wallowing.” This deters biting flies, removes tufts of molted fur, and during the rut allows the bulls to leave their scent and display their strength and vigor. Always give bison a lot of room! They can exceed over 2,000 pounds and can run up to 30 miles per hour. When Lewis and Clark explored the West in the early 1800s, more than 50,000 grizzly bears roamed America between the Mississippi River and Pacific Ocean. It took less than a century for humans to eliminate grizzlies from 98 percent of their range. The preservation of grizzly bears and their habitat in the Greater Yellowstone area is one of the highest priorities of park management. The effort to protect bears began in the late 1960s, with the closing of Yellowstone’s open pit garbage dumps. Bears that had developed strong, irreversible ties to human food were relocated or “removed,” and once this was achieved, more positive, preventative strategies could be put into place. Today, the Greater Yellowstone Ecosystem is one of the last two remaining large-scale core habitat areas with grizzlies in the lower 48 states. The park is home to approximately 150 grizzlies living completely or partially inside the park, with an estimated 675 to 840 grizzlies in the Greater Yellowstone Ecosystem. It’s thrilling to see these majestic animals—especially when you’ve remembered (always remember!) to carry your bear spray. When Yellowstone National Park was established in 1872, wolves prospered in the area. Their important ecological role wasn’t understood at that time however, and wolves were routinely killed to protect livestock and property. In 1975, wildlife surveys revealed that there was no longer a viable wolf population in the park. In 1994, after a 70-year absence, the Department of the Interior’s Fish & Wildlife Department announced a plan to gradually reintroduce the northern rocky mountain gray wolf into Yellowstone and central Idaho over a five-year period. Three groups of wolves were introduced, 14 total, all from the Canadian Rocky Mountains of western Alberta. In 2016, those 14 wolves had become more than 500, with ten packs living in the park and other packs homesteading other public and private lands in Montana, Idaho, and Wyoming. To hear the wolves of Yellowstone howl you just (just) have to be in the right place at the right time. A lot of Off the Beaten Path travelers will attest to that advice. You’ll never hear them if you don’t get out there and try. But when the stars line up, the goosebumps on your arms and lump in your throat are reminders that it was all worth it. The full impact of visiting a thermal basin only hits you when you’re enveloped in the sulfur-scented air, listening to the curious plop-plopof the mud pots, and thrilling to your first geyser eruption. Yellowstone holds 60 percent of the world’s geysers and hot springs, primarily in nine separate geyser basins. The Upper Geyser Basin alone has 410 geysers (including Old Faithful) and the Norris Geyser Basin has 193. 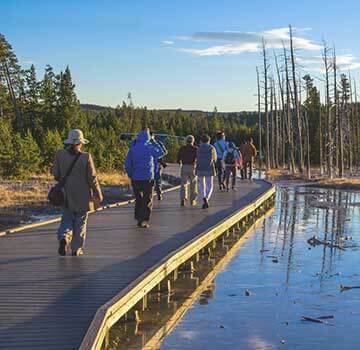 All of Yellowstone’s major geyser basins are networked with wooden boardwalks so you can walk and explore and get close to the features without disturbing the fragile soils. Some of the more famous and fascinating thermal features include Grand Prismatic Spring, Mammoth Terraces, Mud Volcano, Roaring Mountain, Sulfur Caldron, and Fountain Paint Pots. The features are interesting enough on the surface, but they become even more fascinating when you learn how they work and what makes them tick. Fun fact: fumaroles (steam vents) are the hottest hydrothermal features in the park, hot springs are the most common, mudpots contain microorganisms that convert hydrogen sulfide gas into sulfuric acid, and thermophiles (heat-loving bacteria) might represent some of the oldest life on earth. As we suggested for wildlife watching, the absolute best way to see and explore Yellowstone’s geysers and other hot spots is with an expert Off the Beaten Path guide! 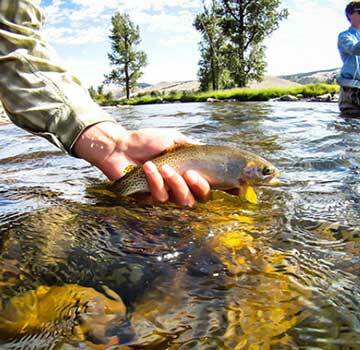 That’s whether you join us for a guided small group adventure or have us plan your private custom trip to Yellowstone. We hope to see you!